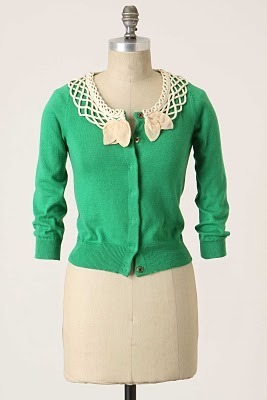 This cardigan with lattice detailing at the collar originally retailed for $98 at Anthropologie. This ModCloth cardigan does differ in several ways, which is why I'm posting it as an inspired by option rather than a regular look 4 less. If you missed out on the real thing and still want a similar style, this may be a great option for you. It retails for $94.99 and you can click on the photo below to purchase.